I cannot believe how fast this year has gone, today is already the first of August. 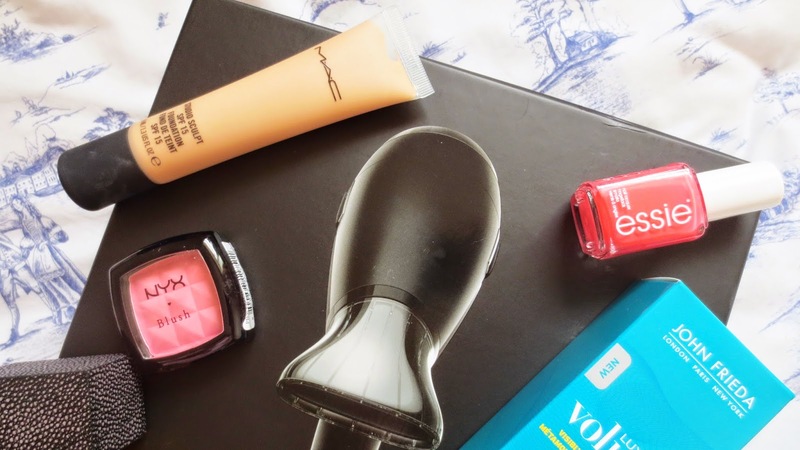 In July I had so many beauty favourites that I will share with you in full reviews soon. I decided to show you the things that have really stood out to me this month and ones I have used over and over again. 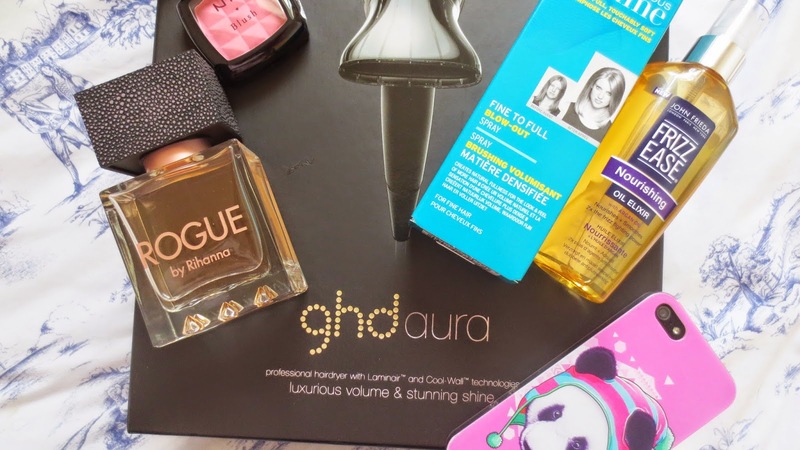 I have enjoyed more hair care products in July due to receiving the GHD Aura, its an incredible hairdryer. GHD Aura: I have done a full review on the Ghd hairdryer here if you fancy a read of it. I have enjoyed hair care in July due to receiving this beauty. This is my first ever hairdryer that I know I can trust without it breaking six months down the line. Its a beautiful masterpiece in my head, it dries my hair super soft and shiny. All I wanted to do is fix my hair from all the dying I put it through and with the help of a couple products I have managed to do this.Two of them by John Frieda which is the Fine to full blow out spray* and Frizz ease nourishing spray*. 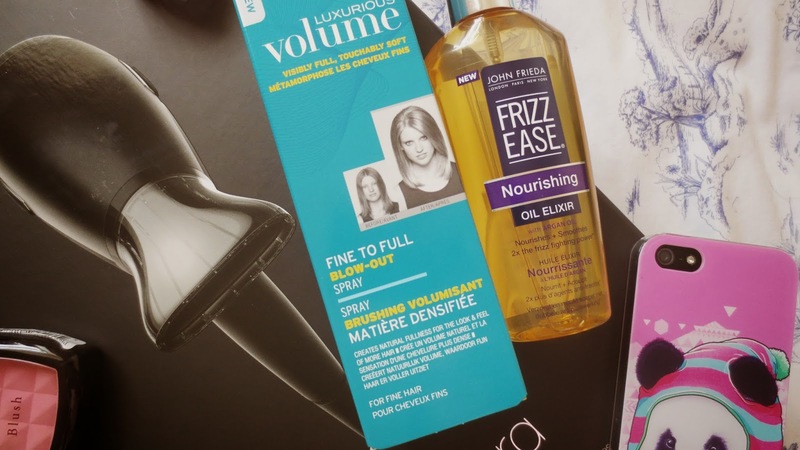 Both have done my hair wonders, I use the Frizz Ease just before drying my hair and it leaves my hair looking shiny and soft. The Ghd Aura helps with this too, it dries my hair super soft and leaves it feeling great. overall an exciting product to use that will sure to stay in my favourites for a very long time. Iphone Case: We all know by now how much I love pandas right? if you don't my header has a cute panda on it that I adore. I just love them they are super cute, my nickname for my dog is panda because she has two black patches around her cute eyes. This Iphone case stood out to me, its different and I love animal illustrations. I purchased this from Ebay for £5.35 which is more than I usually spend on cases, I change them so often but this one I knew I could use again and keep it safe. what do you think of it? Essie: I have to admit this, I only just purchased some Essie nail polishes for the first time. I am crazy I know, they are truly perfection. The shine you get from them, the lasting wear and I got so many compliments this month due to the colour Cute As A Button. I think my Essie obsession has started because I really want more of these babies. Make Up: In July Rob purchased me some Mac foundation as a little gift, I really love the finish of it. I want to wear it everyday but then I also want to save it for special days. Its got the perfect coverage I am after and a lovely glow to it. It makes my skin look super healthy and it matches my skin tone. The lovely lady that worked in Mac at the Trafford Centre was very helpful, she matched me to one and was very polite. I am so excited to wear this foundation more often, it was fun to use and leaves me with the right coverage I really want. I will do a full review soon for you on this one. I have been using the NYX blusher, I am so pleased with it. Its a great colour for the Summer and creates a natural glow. Perfume: I have so many perfumes in mind that I would love to add to my collection but this was one I never considered until I was lucky enough to try it out. I am so amazed by it, it smells gorgeous and its one I love to use most days, its a great one to wear all day. It gives of a tough but yet flirty fragrance and what I truly love it that the bottle represents Rihanna well. I love the detail on the bottom of it and the lid draws my attention to it every time I use it. I will do a full review for you soon on this one and let me know if you have this perfume. Life: July brought me some amazing news, I found out on the 7th of July that I was shortlisted in the Cosmopolitan Blog Awards in the category Best Established Beauty Blog!! Thank you to anyone that has already voted for my little blog and for all the lovely messages and emails, its truly made my year already. Voting closed this month (29th Aug) so if you love my blog and would like to support me please vote for Kemples, I am in the first category. I am looking forward to the event and finding a lovely dress, meeting so many inspirational bloggers too. Words cannot describe how happy I am and how much my blog means to me, thank you for taking time out to read what I write and for all the support. I have cried happy tears this month, your support makes me incredibly happy. Gorgeous Essie shade. I really want to try the Mac studio sculpt foundation! I need to purchase that MAC foundation! I've seen so many good reviews on it but have been a bit put off by the prices of MAC makeup, I definitely just need to take the plunge and buy one! Good luck with the cosmo awards lovely! Aw wow thank you so much lovely! !